La Salle Academy's Jr. Prom was held at the Crown Plaza in Warwick RI. The students enjoyed a full sit down dining experience and were beautifully dressed in formal attire. The room was decorated with beautiful centerpieces and linens and featured a large balloon arch. Dinner and photos lasted just over 1 hour and 45 minutes and by the time dinner was served, the students were excited to get the party started. 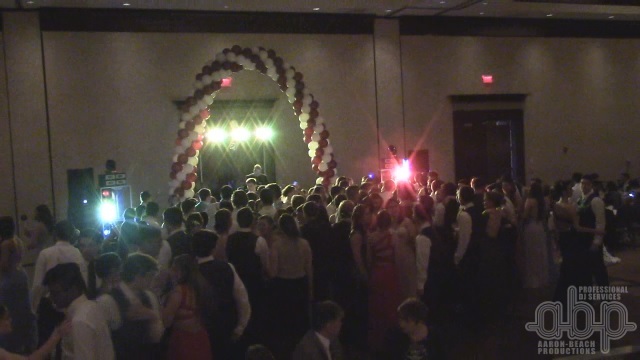 Once the music began, the students packed the dance floor all night right up to the last song proving that using a formalized playlist that the student create ensure their event is taylored to the students vision for the evening. The formal announcements did not have a Prom court, but did have a King and Queen crowning where student energy was off the chart. A good time was had by all and we look forward to their next event!